AMD’s staunchly amazing 2017 was so hard to follow up that often compare company’s performance 2018 to Age of Ultron in the grand scheme of the Marvel Cinematic Universe. (This is going to be a long, winding metaphor here, but stick with us here) Last year, was practically AMDs first Avengers movie in that it pulled off what nothing we had seen before with Ryzen making Intel quake in its boots, the first 16-core HEDT chips and the first few exciting graphics cards from AMD in a long time. This year was a definite improvement with the introduction of Ryzen 2nd Generation and Threadripper 2nd Generation CPUs, but there was also the severe lack of almost any new discrete GPUs whatsoever. More than anything this year felt like a hold-over – almost a preamble – to AMD’s version of Infinity War that will herald its first 7nm processors and graphics cards coming next year. AMD couldn’t have had a stronger start for 2018. The company was performing well off the back of its new processor families while largely dodging the Spectre and Meltdown vulnerabilities plaguing Intel. At CES 2018, AMD also made a strong showing announcing new entry-level, quad-core mobile processors and powerful Ryzen APUs that would introduce discrete-class Vega graphics to desktop CPUs. The AMD Ryzen 5 2400G and Ryzen 3 2200G were easily highlights of the year in their ability to play modern games at Full HD without breaking a sweat. AMD’s integrated graphics were so impressive that Intel and AMD teamed up to create its first mashup chip, Kaby Lake G. This chip found its way into the impressively powerful, yet small, Intel Hades Canyon NUC, as well as some gaming capable 2-in-1 laptops like the Dell XPS 15 2-in-1 and HP Spectre x360 15. In a true show of force, AMD even announced it plans for the rest of the year all the way into 2020. In 2018, AMD planned to introduce its 12nm Zen+ architecture, would lead to Ryzen 2nd Generation and Ryzen Threadripper 2nd Generation processors. Beyond that, the company also laid out its plans to introduce 7nm Zen 2 architecture following that, as well as 7nm Vega and Navi architectures on the graphics card side. Silicon companies typically don’t reveal what they have in store for even the coming year, so to get detailed, multi-year roadmaps like this was incredible and unheard of. We had to give AMD props for this. Like Nvidia, AMD was heavily impacted by crypto, which is to say the company was both profiting from the extreme demand for bitcoin mining GPUs while trying to stay true to gamers first. The company was doing so well from cryptocurrency that it even managed to outpace the popularity of Nvidia for a short time. Despite, doing extremely well thanks to mining, the company promised its first-priority was to gamers. Interestingly, to try and stem the shortage of graphics cards, AMD suggested mining with its Threadripper high-end desktop processors. Thankfully, we wouldn’t have to wait too long into the year for some new Ryzen 2nd Generation processors. The first quartet of AMD 12nm processors would arrive on April 19th with the introduction of the Ryzen 7 2700X, Ryzen 7 2700, Ryzen 5 2600X and Ryzen 5 2600. All of AMD’s Ryzen 2nd Generation processors pushed the envelope with their higher clock speeds and enhanced overclocking capabilities. In our reviews we found the AMD Ryzen 7 2700X to completely overtake Intel’s existing flagship mainstream CPU, the Intel Core i7-8700K, while the AMD Ryzen 5 2600X was easily the best mid-range CPU for power users. Unfortunately, AMD didn’t really produce nearly as many Ryzen 2nd Generation processors as it did for its previous family of chips. In fact, we had to wait until September for AMD to release its next Ryzen processors, the Ryzen 5 2500X and Ryzen 3 2300X, but these were chips that average consumers couldn’t even purchase. Instead, AMD chose to reserve its lower end chips for OEMs and system integrators. To this day, you still can’t get these CPUs without buying a pre-built PC assembled around them. Overall, we would say AMD did a great job of delivering even more impressive CPUs, but they felt like much more of a blip than setting the narrative for all of 2018 as the previous generation did last year. AMD really threw down the gauntlet at Computex 2018. The company saw Intel’s 28-core processor and raised it a 32-core CPU mammoth, which we would later learn was the AMD Ryzen Threadripper 2990WX. At the computing-focused show, AMD also revealed a new nano-version of the Radeon RX Vega 56 and details of its next-generation 7nm Radeon Instinct graphics card – unfortunately, this would the last time AMD would talk about graphics cards until much later into the year. Not long after Computex, AMD official announced four new Ryzen Threadripper 2nd Generation processors in August. These HEDT processors that not only increased core counts, but also performance while lowering prices. The Ryzen Threadripper 2950X was the perfect example of our latter points, as it vastly outpaced the outgoing Ryzen Threadripper 1950X while coming at a slightly lower price point. Meanwhile, the 32-core and 64-thread Ryzen Threadripper 2990WX delivered the highest multi-core performance we had ever seen from a high-end desktop PC. It seemed like AMD was on track to completely dominate the high-end desktop market, unfortunately, the company waited until the end of October to release the Ryzen Threadripper 2970WX and Ryzen Threadripper 2920X. By this time Intel has announced its Basin Falls Refresh HEDT family and the greater threat of the Intel Core i9-9900K. If there was one thing AMD lacked in 2018, it was graphics cards. Aside from the impressive integrated graphics the company introduced at the start of the year, AMD only announced a ‘new’ range of Radeon RX 500X Polaris GPUs for OEMs (which were sadly only new in name), a nano-sized version of its existing Radeon RX Vega 56 and a new Radeon RX 590 for the mid-range market. This practically left Nvidia’s new Turing RTX 20-series of graphics cards unchallenged in 2018, but we have high hopes for the 7nm graphics cards AMD is due to announce in 2019. Although AMD didn't have much new GPU hardware in 2018, it brought a ton of new software. First in March, the company rolled out a Project ReSX (Radeon eSports Experience) update that tuned its graphics cards for eSports games. With its annual software update, AMD Radeon Software Adrenalin 2019 Edition brought a ton of new features including streaming both traditional PC games and VR games to mobile devices. What's more, it added the ability to automatically overclock your graphics card and a ton of new features aimed at steaming gamers. 2019 will be arguably AMD’s biggest year yet. The company has already announced that it would talk about its 7nm processors and graphics cards at CES 2019. This should lead to AMD introducing its 7nm Zen 2 architecture that will lead to Ryzen 3rd Generation and Ryzen Threadripper 3rd Generation processors. From what we know so far, AMD next CPU family will start with quad-core entry-level chips and stack all the way up to 16-core mainstream processors. We may even dare to dream of 48-core or 64-thread HEDT processors on the HEDT front. Meanwhile, AMD 7nm GPU architecture could lead to the introduction of both Vega II and Navi graphics cards we sorely wanted this year. If AMD can successfully pull off all three of these products next year, it will assemble its Infinity Gauntlet of silicon to snap Nvidia and Intel out of existence (or at least from their comfortable thrones). AMD’s greatest threat next year will be Intel, as the company is gearing up to introduce its 10nm Sunny Cove processors and we might even see the introduction of Intel Graphics Cards as well. 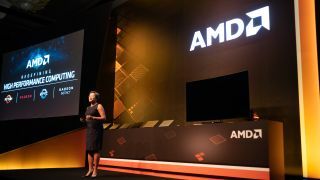 No matter how you slice it, 2019 should be one of the most exciting years in computing and AMD will undoubtedly play a big part of it.